Get back on track. Get to the essence of your reason for BEING here on Earth- your own unique mission and purpose. Use the power of the Mandala and Labyrinth to let go of what is old, inessential and distracting. Return to the core of WHO YOU REALLY ARE and what you are here to do. 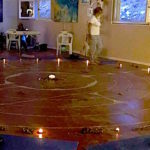 Through these Ancient Sacred Forms you can re-align your center with the forces of creation. 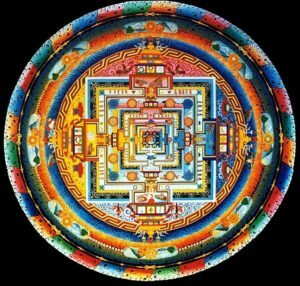 The Mandala and the Labyrinth are sacred containers of wholeness and holiness. In this deeply experiential week, we will use these ancient forms to guide us home. Mandala is a Sanskrit word that means “circle” and “wholeness”. 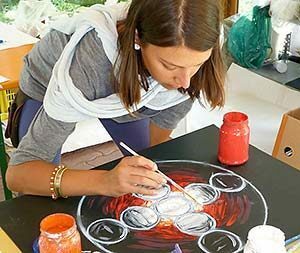 Working with the Mandala helps us to come to the deep center within us. Here we remember our true priorities and align with the highest purpose of our life journey. 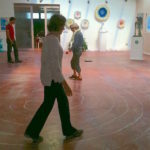 The Labyrinth is an ancient tradition that uses an outer path to bring us to our own center. 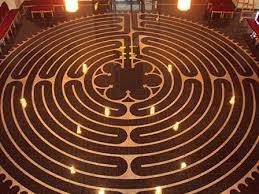 Whether made of stones on sand or inlaid marble in Chartres Cathedral, a Labyrinth is a circuitous winding path that leads to the center and back. The labyrinth is a walking meditation, a pathway of prayer and an archetypal blueprint of our soul’s long journey. 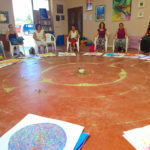 Each participant will be guided in a process of inwardly centering deep within themselves, while outwardly creating their own unique healing Mandala- a powerful visual tool for clarifying & focusing your life. We will also together create an actual Labyrinth, and experience its power on a magical evening with candlelight and live music.